When a bands career exceeds 20 years and sixteen plus albums it is difficult to know where to start. To any newcomer to the world of Sonic Youth I would point them in the direction of their fifth album Sister. This is an album often unfairly overlooked in favour of its big brother (Ha!) Daydream Nation or their more heavily promoted major label records released throughout the nineties. 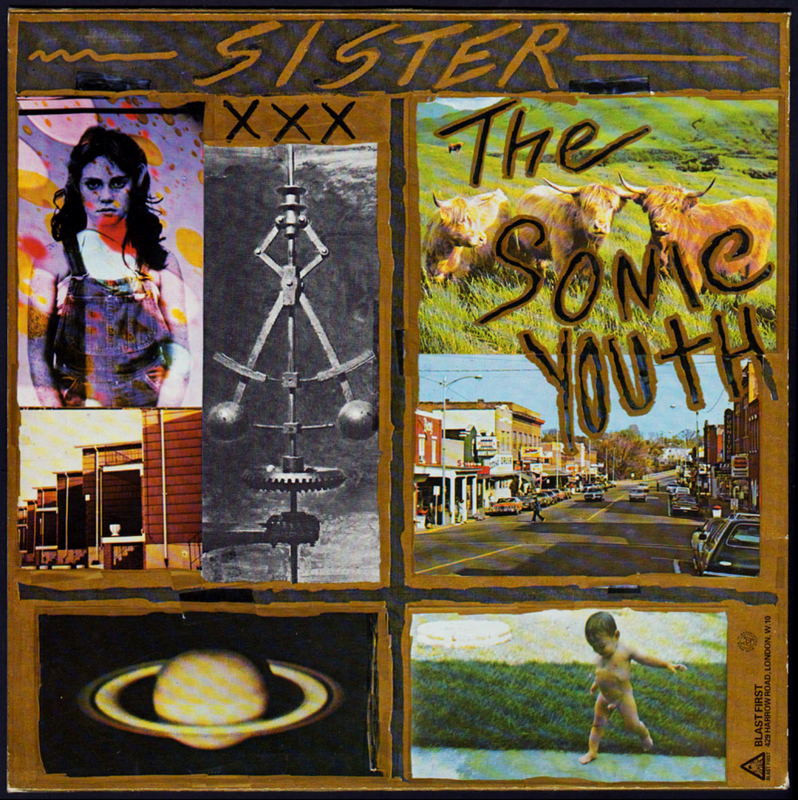 Sister was released in 1987, arriving in the middle of a perfect three album run (between EVOL and Daydream Nation) that rivals Bob Dylan’s similar run of albums in 1965-66 for inspiration to a rock underground. Recorded at Sears Sound in the middle of Times Square, it fits in perfectly to a line of New York rock that stretches from The Velvet Underground through Patti Smith and the Voidoids. But theres more to it than that. As a band they capture something of the American Night better than any band since the Doors. There is also a real classic psych/garage rock feel to a lot this record – imagine the frantic Feathered Fish through a New York/No Wave Filter, or a post punk take on Voices Green and Purple. Sister finds The Sonic Youth (as they are called on the sleeve) moving away from their earlier sound into more arranged songs and sounding all the better for it. The twin guitars of Ranaldo and Moore still coil and snake around each other like Verlaine and Lloyd or Quine and Julian. A lot of Sister reminds me of those early Eno/Island Television demos when Richard Hell was still in the band, when the songs were not quite formed, the guitars still feeling their way into the songs and stripped of the raunch and polish that Andy Johns brought to Marquee Moon. The songs still ebb and flow often breaking down halfway through. That they hold together so well I think is down to Steve Shelley, now fully integrated into the band. Opener Schizophrenia comes on like the Cramps covering I Worship The Sun, or is it Felt covering Can’t Find My Mind. Either way, two minutes in the song collapses in on itself the way only Sonic Youth seem to be able to do as Kim takes over vocals from Thurston and the song shifts somewhere else- “The future is static, it’s all in your mind”. It is really quite beautiful. (I Got A) Catholic Block has such a killer riff. In the summer of 1988 I used to wake up every morning to the live version of this song on the Rhythm and Noise compilation cassette given away with Underground magazine. It was like waking up to someone throwing a firework in your bed. Beauty lies in the eye distills Patti Smiths first three albums into two minutes twelve seconds, and yet sounds nothing like her. Take the atmosphere and mood of We Three, add the turbulent guitars of Birdland and transmit it from the furthest reaches of Radio Ethiopia and you might get close to the beauty of this song. Stereo Sanctity opens with Thurston and engineer Bill Titus trading “Seven”’s (and Seven and Seven is?) before taking us on a white knuckle ride through Phillip K. Dicks psyche. Side one closes with Pipeline/Kill Time – “Stretch me to the point where I stop” such a classic opening line to a rock and roll song. Side two opens with Tuff Gnarl like folk rock gone wrong, Thurston cutting up fanzine reviews to form the lyrics. Kims Pacific Coast Highway is up next, sounding like the worst hitch hiking experience ever. Again after one minute the song shifts mood to somewhere prettier before grinding back. A cover of Crimes “Hot Wire My Heart” makes perfect sense here. It took me about another fifteen years before I managed to hear the original and its influence on the Sonic Youth sound was not hard to spot. Cotton Crown starts like the band trying to ape the Steve Miller Bands “Song For Our Ancestors”, relocating it from the San Francisco Bay to the the Hudson river, before becoming one of Sonic Youths more sensuous songs. Of course it doesn’t stay that way for long. I can never figure out if this is a love song to a person (“Angels are dreaming of you”) or a city (“New York City is forever kitty”) or something else entirely. The album closes with punker White Cross, another catholic guilt song.